A quick release payload mount makes a lot of sense on several grounds, namely: portability, versatility and ease of setup. Some of the bigger multirotors on the market are pretty unwieldy beasts. Take the Tarot Ironman T1000 or the CineStar 8; they are both heavy lifting octocopters with a wheelbase over 1m! By the time you have attached a 3-axis gimbal, you'll need a small van to transport them. 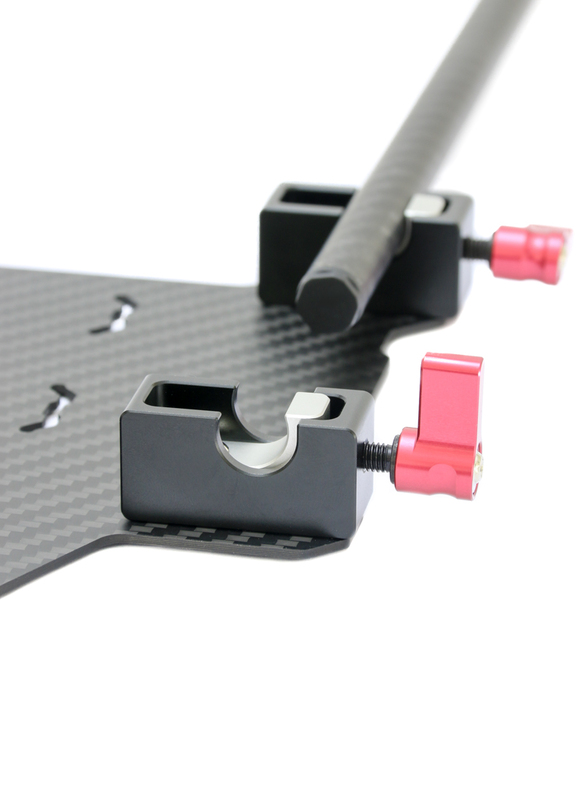 For large drones like the Ironman or Cinestar, a quick release mount comes in handy as it can be used to quickly separate a rig to make it more manageable for transporting. Even if portability isn't an issue, a quick release mount can transform the versatility of your rig. With drone technology currently surging forward, there are evermore payloads being designed for multirotors. The recent advance of lightweight LiDAR systems for aerial mapping is just one of many new sensors being miniaturised for aerial applications. Without a quick release mount, changing payloads can be time consuming. So much so it can be justifiable to have multiple rigs, one for each payload. With a quick release mount, the inconvenience is taken away; it only takes a matter of seconds to swap out a payload and rebalance the rig with the new payload for optimum GoG (centre of gravity). The mount uses four high grade aluminium quick release clamps which very securely clamp to 12mm rails. They are operated without tools, thanks to a neat little thumbscrew handle. The mount is compatible with wide rail mounting systems: either 155mm or 165mm (please select from the dropdown as appriopriate). 155mm is the standard used by DJI for frames such as the S800 and S1000, and also Tarot’s T series multirotors, for example the T810, T960, T15 and T18. 165mm is the new specification used on the Tarot X series frames: X4, X6 and X8. 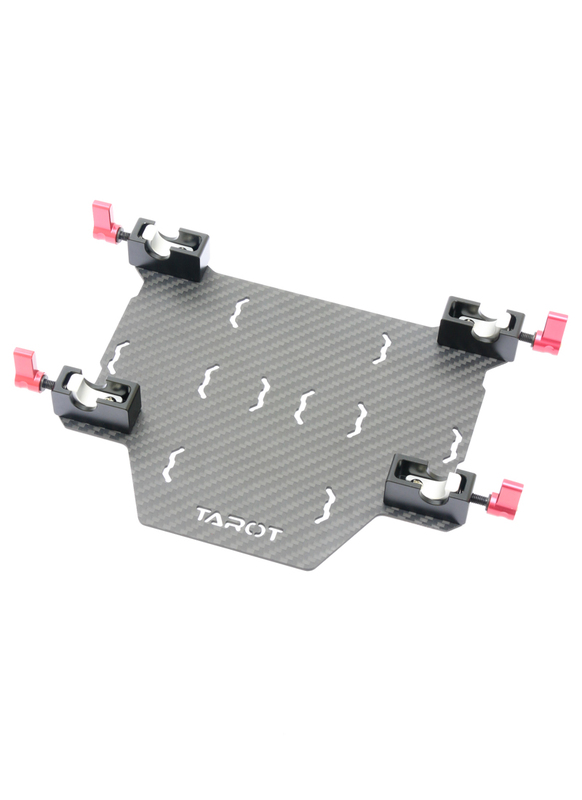 The plate itself is Tarot’s TL8X017 battery mount. It’s made from lightweight 3K Twill weave carbon fibre so it weighs only 60g and yet it’s very strong. It’s sizeable too and can easily accommodate a 6S LiPo. It already has slots for locating battery straps and it could easily be modified to secure other payloads like a brushless gimbal. The best thing about this quick release payload mount is the price; similar systems like the Vulcan mount start at £110, while the 2-clamp photohigher AV200 mount retails at £199. What is the lateral length between the very ends of the thumb screws before being tightened to the 12 mm carbon fiber tubes (still have room to drop the adaptor onto the carbon fiber tubes. Thank you! Hi, if I understand what you mean correctly the maximum gap before tightening the thumbscrew is about 13mm.